Neither of my parents have started companies. I went to college and graduate school in their entirety without dropping out. I don’t have a lot of money (nor access to much). And yet – I am an entrepreneur.The truth is, the majority of entrepreneurs are more similar to me than to their opposite. Society and media have chosen a few outliers to these standards and made them so much larger than life, that it has now clouded our vision of who can be an entrepreneur and what an entrepreneur should be. “Entrepreneurs are born” – there’s not a gene for entrepreneurship. Trust me, if there were, we at MIT would have isolated it, studied it, and learned to replicate it. More than half of entrepreneurs are the first in their family to start a company, a rate that is fairly close to any other career such as engineering, education, or the arts. So while there may be some parental encouragement and predisposition, it’s statistically similar to most other fields. “Entrepreneurs learn from experience, not school” – there seems to be a popular belief that in order for entrepreneurs to be successful, they need to drop out of school to devote themselves 100% to starting a company as soon as possible. But education matters for entrepreneurs. 95.1% of entrepreneurs have bachelor’s degrees, and 47% even have advanced degrees! Those other small portion are often more forced into the need for starting their own venture versus having the means to attain an education. “Entrepreneurs need to be… charismatic, ruthless, smart, loner, creative” – our perception of entrepreneurs is skewed by a few outliers. Entrepreneurs like Steve Jobs, Elon Musk, Mark Zuckerburg, and Bill Gates make us think that you need to have these characteristics to be successful as an entrepreneur. They each represent the <.01% that grab the public attention, but aren’t representative of the vast majority of very successful entrepreneurs that make it in the startup world. It takes all types, and there’s not one mold. Plus, entrepreneurship is a team sport, with average team sizes being 2.4-3.3 (depending on the source), best suited to a mix of co-founders of a hacker (tech person), hustler (business person), and hipster (designer). While every generation has an arrogant leader that is idolized (Steve Jobs, Jack Welch, etc. ), studies show that the best leaders hold very different qualities. Good to Great studied what allows companies to achieve exponential growth, and it comes down to superior leadership – Level 5 leaders – containing an ideal mix of humility and determination. These leaders know how to look internally when things are going poorly, while attributing successes to others when things go well. “Most companies fail” – 18% is still a pretty gloomy success rate, and yes, that means that most startups fail. But there are ways to increase your chances and stack the odds in your favor. In fact, the MIT success rate of startups is a whopping 76%! 25,800 companies are still operating out of 33,600 started. The operating companies account for $2 trillion annual revenue, which to put in perspective, would be the 8th largest economy in the world if they were their own country. While MIT students may have some selection bias of intelligence, it’s the entrepreneurial process that is the key difference that accounts for this huge leap in success. The Martin Trust Center for MIT Entrepreneurship teaches Disciplined Entrepreneurship – a 24 step process that guides students through assessing the needs of their customers, filling those needs, reaching them, extracting value financially, building it, then growing and scaling. Check out www.d-eship.com for more. “Gotta spend $$ to make $$!” – funding should be a much later consideration, not an early one, and it usually takes much less to start a company than one typically imagines. Depending on the source, the average amount of money to start a company is $10k-$30k. So again, we are skewed by media sharing information about the millions of dollars that just a few companies are raising, while the majority of companies are able to be started on much less. In addition, the source of funding is rarely VC’s, or venture capitalists, which is the source that many people think is the first step, but is actually a much later stage and higher dollar round. 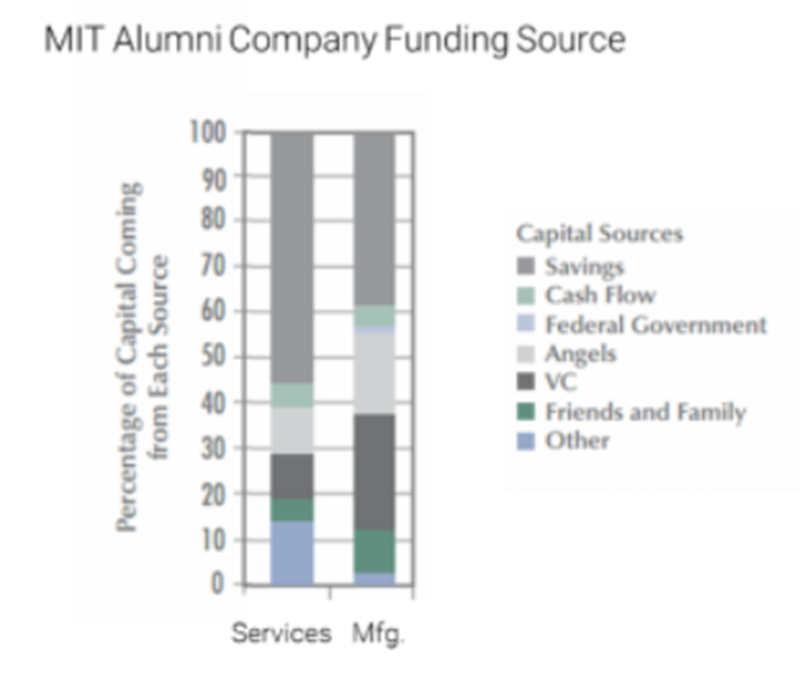 A study of the sources of funding of MIT Alumni companies show that the majority of funding comes from the founders’ savings, with only manufacturing based companies having slightly more money from investors, since they need more up front capital. There is not one mold of an entrepreneur. They don’t need to be the best at every aspect of a company. They tend to be educated. They are resourceful about funding the company. Thanks a ton, Laurie for the article and MIT Launch-X . This article reiterates that I am in the right recovery path. I am a software engineer by profession working next to MIT Cambridge. Had launched two startups back in India in last 10 year period. The products were of high quality but ended up in a (recoverable) loss. None of my relatives or friends are an entrepreneur and hence starting a company was always a mess. My family culture is to support the family once you are graduated and to run a non-conventional business instead is always treated as a crazy attempt. So with a calculated risk, the first product(not a startup) attempt was during my last semester of bachelor’s and during first 7 months before joining a corporate firm that I got recruited from my college. I still believe the product has huge potential at that time but I lacked any idea on how to monetize it or form a startup. I did not have anyone to mentor or to provide feedback. My deadline for making the company profitable was before joining the corporate firm and that did not happen. I ended up using this product for getting into good projects in my initial period of the career. Lesson Learned: Get a good mentor, Need to have a strong vision including how to monetize, 80/20 rule is very important, ensure you have good savings before starting. For the second time, I have generated enough savings for another attempt. I build a team back in India to execute my ideas. I have mentored and funded them(since I had another full-time job). I respected 80/20 rule and the product that we launched was feature rich MVP and was featured on mainstream websites. But the platform that we used to launch became a failure. The team eventually lost vision and the team was not prepared to execute Plan B strategies. The team consisted mainly of individuals who have potential to create a product but not to sell. It was very difficult to remotely execute my ideas with another full-time job at hand. So eventually we failed. Lesson Learned: Completely involve in the execution of the startup idea, Make good network to access the best path, Build well round and trustable team. Note: I have started working on the MIT Launch X course. The plan is to understand my shortcomings better before organizing another start up in a year time. It will be nice if you could give throw some light how I could take leverage of my geographical advantage here. I am next to MIT and which all events/programs should I be participating to build an Entrepreneurship network and for learnings? Thank you very much with the very informative and motivating texts i have ever read on entrepreneurship. This article gives motivation , which I need a lot. Thanks!! Extremely great life-saving information. This is a huge reiteration that learning in any way shape or form from MIT and people like Laurie Stach and Bill Aulet is large competitive edge! well im liking all the articles and thank you very much to the edx for making us more knowledgeable. Previous PostPrevious What Does It Take to be Successful?